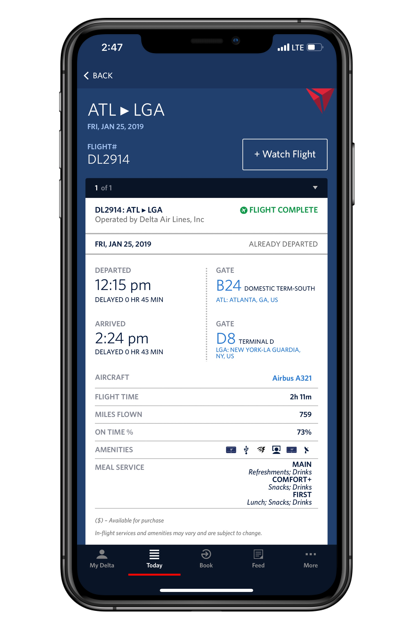 SkyMiles Members can now use the Fly Delta app to​​​ purchase a seat upgrade using miles instead of cash. The new app functionality comes on the heels of overwhelmingly positive customer feedback to Delta launching the post-purchase upgrade payment option on Delta.com in December. The flexible option, made possible by Delta's ongoing digital investments, gives Members traveling for business or leisure the ability to use their personal miles via the Fl​y Delta app or Delta.com to upgrade their experience whenever they fly — and miles can be used to upgrade a single leg or multiple legs of a journey. Using miles for upgrades after booking builds on the functionality Delta pioneered with post-purchase upgrades in 2017 that allows customers to buy a premium seat online using either the same or a different method of payment from the one they used to buy their ticket.